In my mind there was a decades long-debate as to who the best rock and roll poet was, Bob Dylan or Leonard Cohen. Being the kind of ersatz pundit who argued passionately for the minority opinion, my champion was Cohen. Critics and audiences and what used to be called Mass Media reached a consensus that gave Dylan the Keys to the Kingdom. All is to say that Dylan has Tin Pan Alley throwing a large shadow over his work. And now, with the death of the Canadian-born poet, novelist songwriter and recording artist on November 10 at age 82 gives the lie to the nonsense of pitting the two songwriters against each other in hypothetical grudge matches; that was the stuff of high school bull sessions, teen age certainty at its most insufferable. Ironically, Cohen’s music was about growing up and, eventually, growing old, if not with grace but certainly with full intent of living fully to the last. This was the rare instance where his work became more profound as I aged, deeper, more nuanced as personal experience matched the literary craft of the songs I admired long and enviously. His songs were an impetus for me to do the same as he, a callow seventeen impatient, in some sense , to grow up and experience heartbreak so that I might wallow in a notion that mine, too, was a life lived fully, if not well, as Cohen seemed to convey in his lyrics. Dark rooms full of teenagers , a thick odor of pot and incense , Leonard Cohen’s voice, a rumbling monotone that made you think of a man speaking low or softly who had just then raised his volume just enough so that you suddenly heard him speak with alarming clarity of phrase and image, a constant, three chord strum on a guitar, this was my first encounter with the songwriter, an artist that planted the seed in many of us to go into the world and experience it deeply, to contemplate those experiences closely and completely, and to write the inexpressible in terms of the unforgettable. How many of us actually did anything remotely like that is unknown; jobs, marriages, wars have serious ways of side tracking or eliminating careers as poets. But Cohen managed it, in a career that began in 1956 with the publication of his first book, The Spice Box Of Earth. The sacred and the profane were subjects that were constants in his writing, not so much mashed together, the arbitrary fusion of unlike propositions , but rather intermingling, the aspects of sensuality and solemnity weaving and through each other, elements of the human spirit’s need to experience feel fully alive. Cohen’s chronicle of how he followed his muse over decades, in songs, poems, novels reveals a man who , I think, obviously believed in God, a deity, though, who might possible not have a Grand Plan for good people after this life surrenders us to darkness. His Higher Power, though, has a subtle and power sense of Irony. If God is in the details, He is in laughing, smirking at least, wondering what is we might learn from the collected experiences a life time accords us. What inspired the poet in me to come alive and chase the muse of learning how to create suggestive sentences was the expansive flashiness of Dylan’s writing, vernacular fireworks that, in their best expression, made no literal sense but still left you with the chilling effect that something was happening that needed a new language to describe the vibe. His songs were public, his lyrics were cast in broad swaths of angular, cubist-bent non sequiturs that were perfect for a generation of youth that vaguely wanted a destiny that would form as all utopias theoretically would, by consensus, without rules, distortions, based on cooperation, in harmony with a natural order that had gotten lost in the rapid shuffle of change since World War 2. Cohen was the other extreme, personal, isolated, reflective to the degree that you felt as though you were invading a private space as you played the albums, the effect of walking into a room you thought was empty only to discover someone in there staring into a dark corner of the space, talking to themselves. Cohen felt deeply, considered his affairs, his pilgrimages, and his constant search for experience that might allow him to grow spiritually and so uncover a more profound notion of a love that does not die. 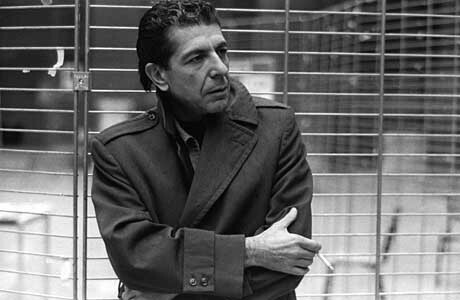 In poems and especially in songs, songs like “Suzanne”, “Hey , That’s No Way to Say Goodbye”, “Hallelujah “, and “Tower of Song”, Cohen artfully balanced two sides of a persona , the soul scarred and deepened by profound happenstance, and the observer, who wittily and with enormous amounts of bemusement recounting a new subtle lesson or a lesson that needed to be learned yet again. This isn’t to say Cohen is philosophically ponderous or didactic; although his songs are prone to many stanzas, Cohen’s lines and images are crisp, ironic, a masterful use of the snappy line no less agile than what Raymond Chandler’s Marlowe would offer. “Tower of Song”, I think, gives full evidence of this songwriter’s ability to be honest and curtly honestly with his allegories and yet it keep it comical. His songs, which I fine the finest of the late 20th century in English–only Dylan, Costello, Mitchell and Paul Simon, have comparable bodies of work–we find more attention given to the effect of every word and phrase that’s applied to his themes, his story lines. In many ways, Cohen was a better writer over all. Unlike Dylan, who has been indiscriminate for the last thirty ways I would say Cohen is a better lyricist than Dylan because he’s a better years about the quality of work he’s released, there is scarcely anything in Cohen’s songbook that wasn’t less than considered, pondered over, measured for effect and the achievement of the cultivated ambiguity that made you yearn for the sweet agony that accompanies a permanent residence in the half lit zone between the sacred and the profane.